Filippo Sauli has escaped the attention of all the works of musical reference that I have been able to consult (from Grove ‘downwards’). 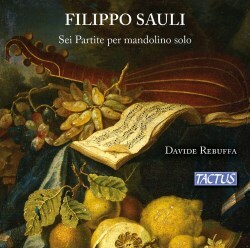 Such information as I can offer comes exclusively, therefore, from the booklet notes to the present CD, by Davide Rebuffa, a musicologist as well as a performer (his edition of these partitas by Sauli was published by Ut Orpheus in 2016). Sauli’s dates of birth and death seem to be unknown. He apparently had Florentine origins, but the first record of him in a musical context is when he was appointed as a theorbist and player of the mandolin at the court of Joseph I at Vienna in 1707. He continued to work at that court and references to him occasionally crop up in court documents. He must have worked alongside the more famous Francesco Conti (1681/2-1732) and probably deputized for Conti when the latter had other commitments. Sauli seems to have lost his job around 1719 and he unsuccessfully sought reinstatement in 1722. Rebuffa mentions no later date in connection with Sauli. How long he stayed in Vienna or whether (and when) he returned to Italy seems not to be known. Sauli’s six partitas per il mandolin solo survive in a manuscript (PU II KK 36), not in Sauli’s own hand, currently in the Roudnická Lobokowiczká at the very handsome Nelahozeves Castle, less than 40 kilometres north of Prague. The partitas are written for a four-course mandolin and on this recording Rebuffa plays them on two early instruments with gut strings. The booklet contains photographs of both instruments. One was made by Stefano Franchi of Florence; it is dated 1727 and was restored in 2008 by Federico Gabrielli of Milan; the other is by an unknown maker of the late XVII-early XVIII century, and was also restored by Gabrieli in 2011. Such limited evidence as there is suggests that this set of partitas was composed in the first decade of the 1700s. In the surviving manuscript all are written in French tablature on four-line staves. Rebuffa suggests that the composer might have expected them to be played with a figured bass accompaniment (if he wrote such himself they seem to have been lost). But as Rebuffa’s own performances show, they work perfectly well without such an accompaniment – though I have to say that the second version of Partita V recorded here, which uses a harpsichord to provide a basso continuo accompaniment (presumably extrapolated by Rebuffa) makes for a less cloistered and more ‘dramatic’ sound. All of the partitas are here recorded for the first time. The partitas have between 4 (nos. IV and VI) and six (I and II) movements. They do not follow, as one might have expected them to do, the model provided by Corelli’s sonatas, since Sauli is also clearly influenced, as the Viennese court in general was, by French models. No. V, for example, begins with a French Ouverture. It would be wrong to make any extravagant claims for this music. It will not change anybody’s perspective on the music of its time. In the nature of things, music written for a four-course mandolin could never be particularly complex or range across too many keys. But Sauli’s writing has a decided charm, and a simple elegance, a quiet and intimate refinement – the experience of listening to them (it is probably best not to listen to the whole CD straight through) is like listening to the conversation of an erudite but unpretentious friend. In both cases a certain degree of concentration is required; the listening cannot be merely passive if the experience is to be enjoyed to the full. Rebuffa’s playing is technically accomplished and he makes a good case for this music. The two versions of Partita V invite listeners to make some interesting comparisons – one of the incidental pleasures that this CD provides. Any reader who shares my love of, and fascination with, the instruments of the lute family and their music will find this disc of interest, in part because of its rarity value, in part for purely aesthetic reasons. Others may think it too specialized a taste.